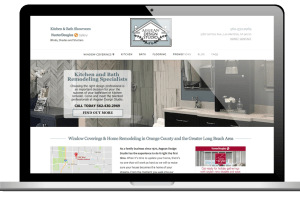 After working with dozens of Hunter Douglas dealers over the last eight years, I've developed a complete website package to meet the need of this industry. Sourcing beautiful window fashion photos, and writing compelling text content, a complete 12-page website will be customized to fit your business. 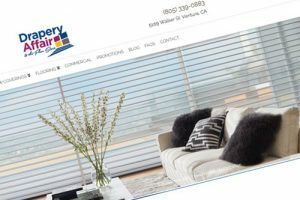 Your new website will feature window fashions, your retail store and all your products and services. This custom website can be up and running in as little as two weeks! 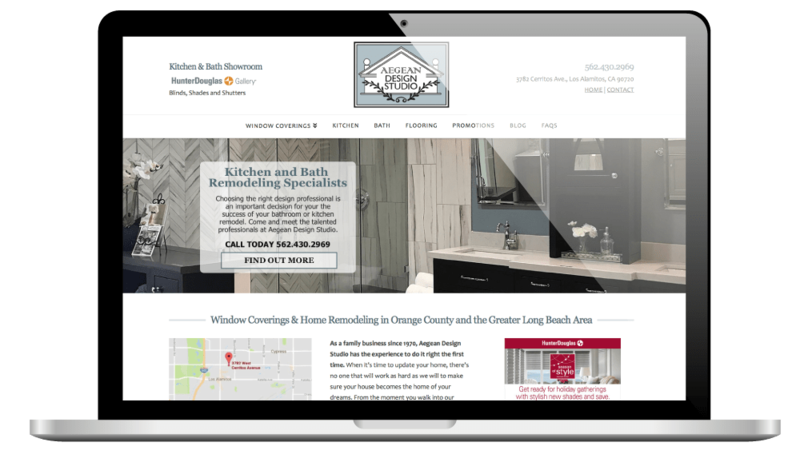 Your website will include a scrolling home page. Panels will include keyword-rich text content I help you write, a slider, photos from your store, a location map, beautiful product photos, testimonials, and links to your social media accounts. We will collaborate to write a custom About page highlighting your story, your business, and team. Make it easy for your customers to find you with maps, hours and custom contact forms. Interested in starting a Blog? I have dozens of blog posts you can choose from, or add your own. You can even add my Style Guide with a dozen articles on favorite home design styles. Need a custom video? I can help you with that too! 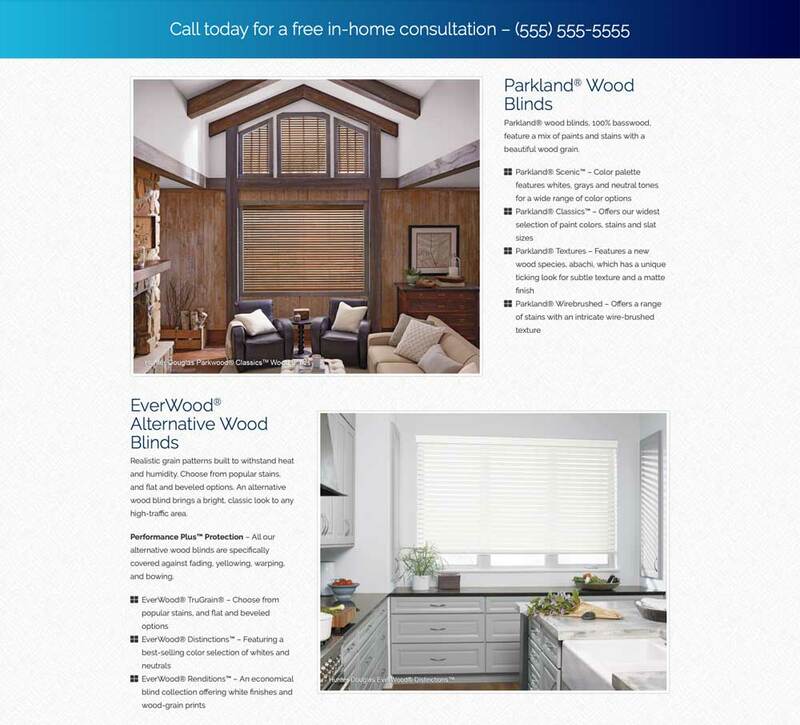 I've already collected beautiful images and written text content describing the complete range of Hunter Douglas window coverings. These pages will be updated to be specific to your market and product offerings. Do you also provide Design Services or Kitchen & Bath Remodeling? Do your products include Flooring or Cabinetry? I've got you covered with ready-to-publish content that I can customize for your business. 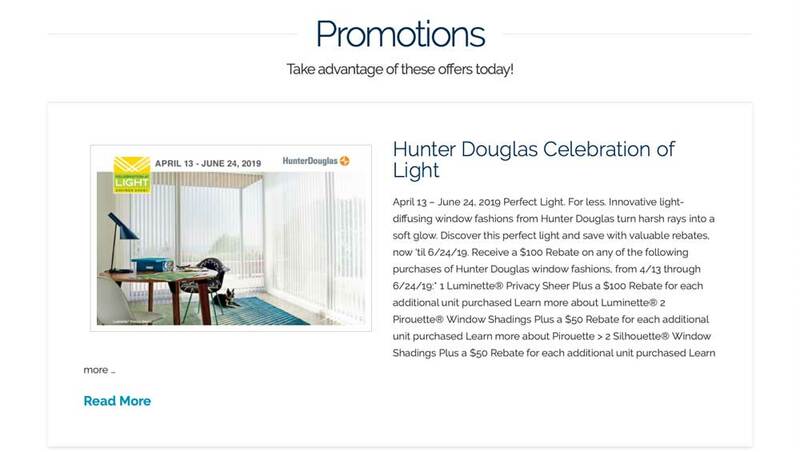 I'll add the Hunter Douglas annual promotions and keep them updated. Your own store promotions can be added as well. Your website will be responsive for ease of navigation and reading for all your users on their phone, tablet, laptop or computer. Complete style guide with posts for twelve popular interior design styles. Each post is 300-600 words and includes 2-5 photos showing current design ideas. Custom Home Page showing your products and services, distinctives, testimonials, and images. 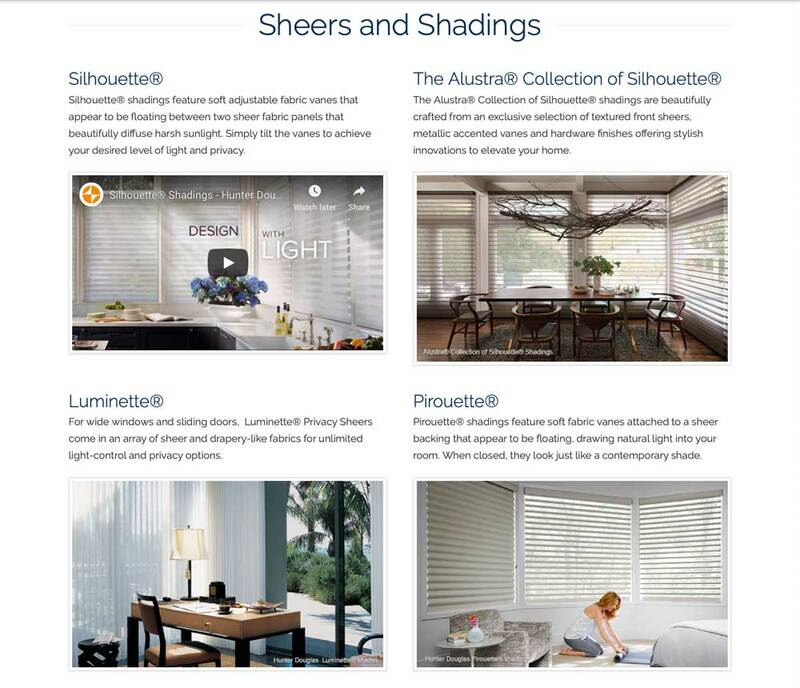 Beautiful Hunter Douglas product photos and features are highlighted. Will my website have the same content as other HD dealers in my area? No, I will only sell this website to one HD dealer in a competitive market area. Your content will also be key-word optimized for your city and business. Do I have to write the content myself? No, the text content for the standard pages has already been written. I will optimize it for you your business and area. Can I re-write the content myself? Will I be able to edit the website? Yes, I will send you every page as a text document after it has been written and you will have the ability to edit it and send it back to me before it is uploaded to your website. Once the website is complete and live, I will provide you with documentation and training via a one-on-one screen share or video tutorials. What will I have to provide? I will have you fill out a simple questionnaire about your business that I will use to draft your About page. Then I will write this page for you; you will have the ability to edit it before it is published. I will also ask you to provide some photos of your storefront, showroom, and/or team. I will need access to your Domain account to turn on your website when it is ready. Yes, hosting is included in the monthly fee for the first year. After the first year, I can continue to host your website for $24 per month, or you can choose a support and maintenance package with hosting included for as little as $49 per month. Yes, an SSL (Security Certificate)and installation is included in the monthly cost.